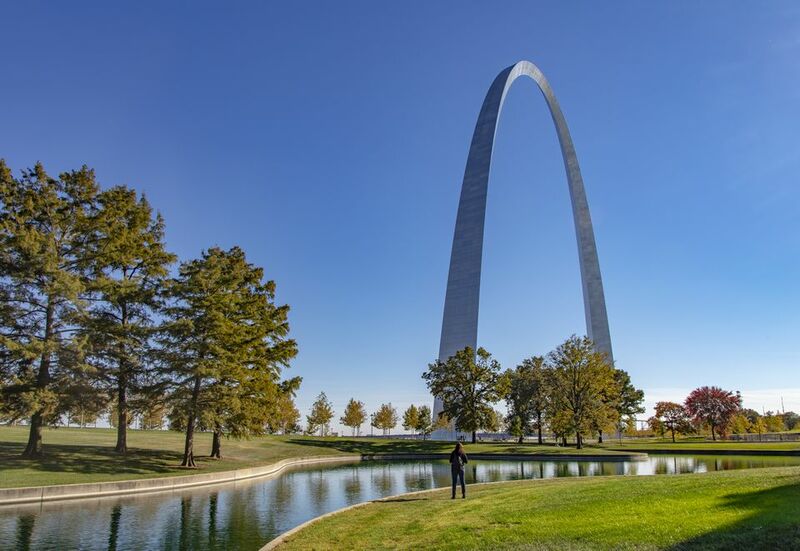 St. Louis bills itself as the Gateway to the West, and it punctuates that slogan with one of the nation's most distinctive landmarks. Whether you're here to visit that Gateway Arch, attend to business, or enjoy some Blues music, be sure to plan carefully. This guide to St. Louis will show a number of ways to enjoy the city without paying top dollar. Spring and fall are the best times, because summer tends to be very hot and humid, and winters see stretches where it remains below freezing for days. A lot of people love to visit when the St. Louis Cardinals are playing baseball. Lovers of the game consider this one of America's best baseball towns. Even if you're not a big baseball fan, the atmosphere is worth experiencing. Find flights to St. Louis. St. Louis has a strong Italian community. Many of the early Italian settlers populated a neighborhood known simply as "The Hill," where you will find a collection of outstanding Italian restaurants. Laclede's Landing, a restored warehouse district downtown, features a variety of fine dining and trendy watering holes, sometimes with prices to match. Because the St. Louis light rail "MetroLink" runs from Lambert Airport terminal to downtown, some people prefer staying near the airport and catching a cheap ride downtown without parking hassles. Others use motels on the Illinois side (Fairview Heights and Belleville) the same way. Four-star hotel for under $150: Omni Majestic on Pine Street. Priceline users can score three- and four-star rooms downtown for as little as $65 USD, if there are no major events in the area. Find St. Louis hotels. MetroLink light rail Red Line runs from Lambert Airport to Shiloh, Illinois, passing the cultured Central West End, Downtown, and Gateway Arch. There is also a Blue Line that runs from Shrewsbury to Forest Park, where it parallels the Red Line as far as Fairview Heights, Ill. It is not convenient to other attractions like Busch Brewery or The Hill. Buses will get you closer to most places. One-day passes for MetroBus and MetroLink are $7.50 USD. The base fare for buses is $2 and $2.50 for trains. Parking for 24 hours at Union Station's south lot is $20 USD, with no in-and-out privilege. You might also want to explore car rentals. The chamber of commerce boasts there are more working Jazz and Blues musicians in St. Louis than any other city on earth. Scores of clubs, large and small, dot the city. The Soulard district, south of downtown, is a place to find many styles of live music. It's a restored 19th-century working-class neighborhood. You can get the latest on what's going on where by picking up a free copy of The Riverfront Times at the Visitor Information Center on Kiener Plaza. This city has a world-class network of green space. The first and most visible hosts Gateway Arch, which sits on a national park property reclaimed from nasty industrial decay to honor American pioneers who settled the West. Order Arch tickets for movies and a ride to the top. You'll avoid lines or sellouts. Also worth seeing is Forest Park, accessible from the Central West End MetroLink stop. It is home to the Science Center, an ice skating facility, and other attractions. The Anheuser-Busch Brewery Tour is among the most popular tourist attractions in St. Louis. You'll find the tour and parking are free, but groups of 15 or more must make reservations. Free samples of the product are available at the end of the 60-minute tour for those of drinking age. There are soft drinks for those who do not consume alcohol. St. Louis Zoo is highly rated and there is no admission charge. It's one of the last major free zoos, but some individual activities do require ticket charges. Discounts for Six Flags St. Louis Print tickets or passes for the park before you leave home and save money. Visit The Hill if you're in the mood for great Italian food. It's about a four-mile drive from the downtown area (take I-44 to the Hampton exit), but you'll find restaurants that serve generous portions at a variety of price ranges. I can recommend Bartolino's (2524 Hampton Ave.) as a place that blends budget, portions, and atmosphere very nicely. You've never had frozen custard quite like Ted Drewes. This St. Louis institution is an easy splurge for any budget traveler. Ted Drewes frozen custard is served upside-down to showcase its thickness, but the taste is its primary feature. The main location is just a few minutes by car from The Hill. Go south on Hampton and turn west on Chippewa. In summer, a second location opens along South Grand Boulevard. Union Station is still a worthwhile stop. Millions of people stopped here as they made their way across North America, but the final passenger trains pulled out in 1978. Now you'll find a variety of shops, restaurants for every budget, and a hotel alongside exhibits and activities for all ages. It's a great place to spend a few hours if the weather is uncooperative. MetroLink stops at the eastern end of the parking lot. Don't let St. Louis' crime reputation frighten you away. Many can cite statistics showing St. Louis to be a dangerous city. Much of the crime occurs in areas you are unlikely to visit, but you can be a victim anywhere. So do use caution, but don't let all the frightening statistics spoil your trip.